← Decorating Ideas for pre lived in new homes. When I think about tulips, two holidays come to mind, Easter and Mother’s Day. Many people get a pot of tulips as an Easter plant. In my neck of the woods, tulips are synonymous with Mother’s Day. 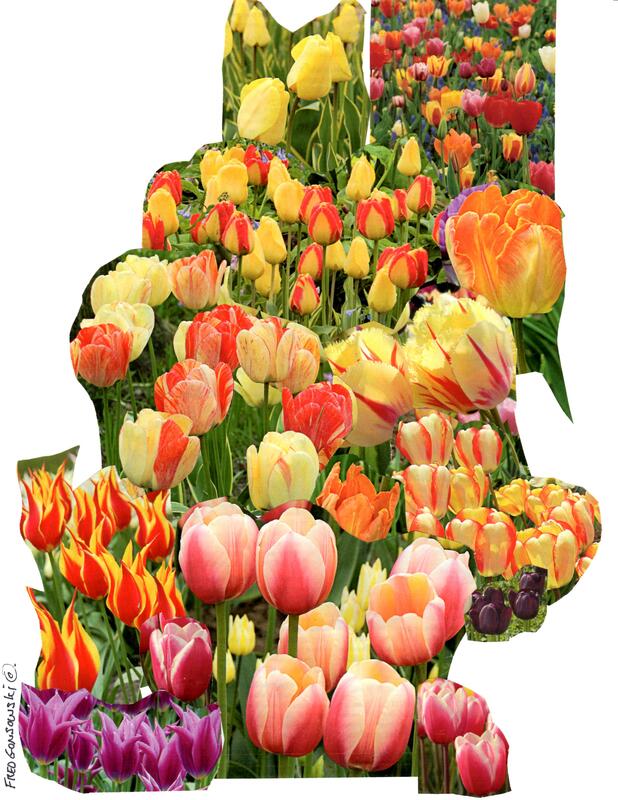 Albany, NY, being a Dutch settlement yearly celebrates the flower with a Tulip Festival. Thousands of tulips are planted in Washington Park, and up and down many streets by the State’s Capital. For about a two-week period, tulips are everywhere, heralding Spring. Planting Tulips…There is a difference between planting tulips in grand displays in public parks, and along city streets, and planting them on your own property. All, or most of the just mentioned tulips, planted in Washington Park, in Albany, after blooming are dug up and sold. You never really get to see the plant mature, and how the deep green foliage eventually turns to a paper bag brown. My suggestion to you is to plant small groupings of three tulips here, and three tulips there, throughout your garden. After they have finished blooming, and start to look unsightly, they won’t stick out that much when other perennials grow up around them. Tulips are planted in Fall, and need 12 weeks of below freezing weather to set a flower for the coming Spring. There are Early, Mid-season, and Late blooming varieties. Plant some of each kind, if you want to spread out your tulip blooming display. Buy large-firm-meaty bulbs. Plant the tulip bulbs in an area where they get about 6 hours of sun light a day, pointed side up, with 3 to 5 inches of soil on top of them. Space them about 8 inches apart, in all directions, if you will be leaving them in the ground from year to year. The Darwin Tulip is said to be a long-lived variety, that will produce flowers for a number of years. Fertilizing Tulips…Tulips need NO fertilization at their time of planting. The tulip bulbs were most likely not allowed to bloom the Spring before they were ready for shipping. Their heads were cut off. All of their energy was put into making a big healthy bulb, for you to buy, not flower production. When planting tulips never but bone meal in the hole with the bulb. Moles, voles, mice, and squirrels will smell the bone meal, and go right for the bulbs and eat them. I know someone who planted 300 tulip bulbs with bone meal. The following Spring, one tulip showed up. Some people say fertilize tulips in the Fall, others say Spring and Fall, I say Spring. Sprinkle a tablespoon or two of a good All Purpose Time Release fertilizer like, Pennington 6-10-6, Jonathan Green 5-10-5, or Espoma Plant-Tone 5-3-3, from where the tulip emerges from the ground, and out 2 or 3 inches all around. Time Release means the fertilizer will feed your plant for weeks. Fertilize when you see them emerging from the ground, to before they bloom. I feel you have to fertilize them in the Spring, because you can see where they are growing. In Fall, without foliage showing, How would you know where they are? Maintaining Tulips …Tulips get their nourishment two ways. They absorb moisture and nutrients from the soil, and they collect light from the sun (photosynthesis). When you buy a tulip bulb, it is an element filled with enough energy to produce foliage and flowers the Spring after planting. When the tulip starts to emerge from the soil in Spring, the energy leaves the bulb and goes up the plant to produce the leaves and flower. The energy, in time has to work its way back down to the bulb, so the tulip can continue living and produce more foliage and flowers the following Spring. The foliage has to be allowed to collect light, and over time, turn a paper bag brown, and die back. The change in foliage color, from deep green to paper bag brown, says to you, that the energy has traveled back downward to the bulb. When the foliage has turned paper bag brown, with a light tug, it will pull away from the bulb. You can also cut it off at that time. A lot of tulips, after a year or two in the ground stop blooming and just become a bunch of leaves. The mother tulip produced a lot of “Bulblets” baby bulbs, around her, and is crowded, and stops blooming. In the Spring, when you see this has happened, dig up the mother and babies, separate them all out, Don’t damage the foliage, and replant the bulbs throughout your garden. Make sure you plant them deep. You don’t want any of the white under ground stem showing above ground. Hopefully in a year or two you will have blooming tulips again. After your tulips have bloomed, cut out the spent (wilted) flower stem. Only leave the leaves to mature. If you get a potted tulip for Easter, or Mother’s Day, after it finishes blooming, cut off the flower stem, take the tulips out of the pot, and separate the bulbs. With foliage intact, plant them in your garden. Hopefully next year you will have tulips at Mother’s Day. So tell me, did you plant tulips last Fall, and did they come up? If you have tulips that have bloomed to years, what variety are they? This entry was posted in Roses, Peonies, Tulips, etc, The Autumn(Fall) Garden, The Spring Garden. Bookmark the permalink. 9 Responses to TULIPS…Planting, Fertilizing, and Maintenance. My husband bought me some tulips for Valentine’s and I planted them in two pots. They both had flowers already and also fell too but one remains with its green foliage while the other withered. The one that remains green I haven’t done anything to it other than water it everyday, like the instructions says (I have been doing the same for the “withered” one also). The brown looking one I cut all the foliage and its seating there in what it seems a pot full of nothing but potting soil. I thought at first that I “killed” the plant watering it everyday but according to your article the brown appearance is normal? Will they bloom again this year or are they pretty much done? I have no experience taking care of plants of any kind, even less indoor potted ones. I was a little too impatient this year. After my tulips flowered and as began to wilt I pulled the leaves and flower stem. Because I didn’t wait untill they turned brown, did I ruin all chances of them flowering next year? Is there any fertilizer I can put on them now, in the fall or even next spring that will help them flower? Love your site!! Thanks for all the time you put into it, you have such great ideas and I really appreciate you taking the time to post it all. Have a great day! You’ll most likely be prompted to restart Windows and let the error checking run on reboot. Thank you for your awesome wisdom on transferring Mother’s Day gifted tulips into my garden! I am thrilled they will, hopefully, be blooming again next year! Thank you, too, for your sense of humor! We novice gardners need to not be so hard on ourselves for our uneducated trials and failures! Now I know who to call, Plant Doctor! Hi there Paula, glad to hopefully be of help. Happy Spring Planting to you!